CD1 1) Highway Star 2) Nobody’s Home 3) Strange Kind Of Woman 4) A Gypsy’s Kiss 5) Perfect Strangers 6) Under The Gun 7) Knocking At Your Back Door 8) Lazy (inc Ian Paice Drum Solo). CD2 1) Child In Time 2) Difficult To Cure 3) Jon Lord Keyboard Solo 4) Space Truckin’ (inc Ritchie Blackmore Guitar Solo) 5) Black Night 6) Speed King 7) Smoke On The Water. This package is basically a DVD, but with two special limited editions. The first includes the DVD plus audio off the concert on a 2CD set (in a CD size package), the other adds 2LP vinyl pressing (along with the CD and DVD). There is no stand-alone CD option. DVD run time is 141 mins approx. Format: NTSC Region 0. Sound options: DTS 5.1, Dolby 5.1, Dolby 2.0. Anyhow, a quick blast through this certainly brings back memories. The heady days of 1985, dashing down to record fairs to find the latest double bootlegs from the start of the reunion tour, swopping new title info with other fans and compiling lists for Darker Than Blue. Should we now sling them all away? Well I suspect for most people this set will be enough to be going on with, and as a historical record of how those early shows sounded, it certainly does the job. The performance is pretty much subject to the same scrutiny we were all giving it back then; driving drums and bass, cutting edge guitar work which sometimes worked, sometimes didn’t, then Ian Gillan riding it all as if his life depended on it. Struggling in a few places, coping manfully in others and sounding wonderful on Lazy, his was perhaps the hardest job of all. Indeed the strangest thing is the between song chit-chat, where the hall ambience and echo make him sound almost exactly like he did on Made In Japan a decade before. Similarities end there by and large; this is a much harder edged band and with Blackmore consciously steering away from the old solos, needs to be taken at face value. What about Jon Lord you ask? Well I would have mentioned him except it isn’t really until Perfect Strangers that you can confidently say he’s on stage at all. This was a massive disappointment at the time (the issue, which began on Whitesnake days, was raised over and over) and is a cause for huge regret nearly thirty years on. He does get a bit more of the limelight on Lazy and elsewhere but by and large, forget it. I assume this is how the audio was mixed for the video at the time and of course there’s very little anyone can do to rectify the imbalance now, but do be prepared. I say ‘assume’ as there is absolutely no information about the audio source, who or where the reissue work was done, nor who remastered it. All we do know is it’s LOUD, and sadly this does make it hard to listen to it in one go, as the head starts to react against the peaks after twenty minutes or so. I appreciate young kids like this sort of thing but most older people (surely the prime market) like a little more subtlety, and are perfectly capable of operating a volume switch. Mind you it did mean I could skip Child In Time (which I’ll try later, IG did suffer in that at some shows) and the grim Difficult To Cure with a clear conscience! Nor do we get to find out exactly when and where it was taped, as the packaging ignores what might be thought of as this very basic detail altogether (though we can confirm Australia as Ritchie throws in his nice little rendition of Waltzing Matilda!). So, label hyperbole aside, this is an interesting release and fills a gap. I really enjoyed Perfect Strangers, though they did make this a lot more powerful as time went on, and also funnily enough Strange Kind Of Woman (though I swear Ritchie is testing Ian out to see what he could and couldn’t hit). Being so early on in the reunion does leave room for later shows, perhaps when nerves had settled, missed cues were less obvious, and everyone could relax and have a bit more fun on stage. And when whoever was operating Ian’s vocal echo in Perfect Strangers could exercise a little more care when selecting the setting! This era hasn’t been well represented beyond the now quite vintage Knebworth release (which I personally think edges this on group performance and certainly on presentation, though Ritchie might be better on Sydney) and seems an area worth exploring given the obvious unjamming of previous problems in releasing tapes from the reunion. I’ve not got around to watching the video yet, but for those who asked the small print suggests region 9 and NTSC. Quite how they could achieve a meaningful 5.1 off this is beyond me, but also irrelevant as we don’t have the kit. Simon Robinson. TOUR ADVERTS – see the original tour adverts on our Deep Purple Concert Listing. All formats available (while stock of the limited editions lasts) at DTB Online store. Great first impression Simon! I’ll offer my own perspective, if I may. I got this as a Japanese import – didn’t want to wait and wanted the Japanese only bonus material! The gig is definitely from December 12th in Sydney. Also I have to note, I’ll probably never listen to the CD’s because the sound on the DVD is better. It’s the same mix as the audio discs of course but listening it on a decent 5.1 system (even on DVD stereo) it sounds much better. Clearer, more dynamic, the vocals and keyboards are a bit more prominent and Ritchie’s guitar sound is less ”rough” – although this is quite a guitar heavy mix – Ritchie fans will be pleased! As for the performance, I agree with Simon’s assessment for the most part. I do think this is a superior document to Knebworth though, in part because that one (the ”In The Absence of Pink” release) lacks two highlights, ”Under The Gun” and ”Child in Time” and also has ”Lazy” from what sounds like a bootleg recording, but mostly because Ritchie Blackmore’s sound and performance (for the most part) are absolutely atrocious. In my view, naturally. I was likewise never impressed with the sound on that release. There were much better shows on that tour and I hope they see the light of day sometimes. Going back to Sydney, you can definitely tell in places that this is one of the first gigs back together again, or as they say a ”warm up” part of the tour. Missed beats, songs not yet fully developed and perhaps a slightly reserved performance compared to some powerhouse displays on a few Japanese, European and USA dates in mid-1985. Though this is something that only we fans will notice. I was also surprised by it though. I will not be sacrilegious and claim that this is on par with MIJ, as that is an overall more polished and focused document with everyone in top form at the time – unlike in Sydney where they are not quite at the top they would be yet – but there were moments on this DVD that I felt matched the power, intensity and sound of a band in their prime. Close your eyes and you won’t know if it’s 73 or 84 in a few places. Overall I would place this release as the second best live release of the reunion are available thus far (a point behind Stuttgart) and definitely as the best live DVD from 1984-today. I had a blast through nearly the whole two hours, Gillan – despite not being in a rare top form he sometimes displayed on this tour, performs like a champ even belting out some screams n’ shouts you’ll not hear on any other post 84 release (and his tone is still somewhat preserved so he sounds great even if he doesn’t sing great in places), Ritchie surprised me with a rather good guitar tone and some fabulous playing (compared to Knebworth) – although he does let his showmanship get in the way of the playing a few times and the rest the guys perform as you’d expect them too. There are some good highlights but I’ll let the viewers/listeners discover the song performances themselves instead of ruining it! True about Lord though. Even in 5.1 he’s still often buried in the mix and the camera rarely shows him too, with no cameras behind him. Seems like they had 1 camera for Gillan, 1 for Blackmore and 1 for the rest/whole stage. But this is definitely a show to be viewed AND listened to, rather than just listened. I initially listened to the cd’s in my car and then on the laptop with headphones and was a bit disappointed. The video brings it to life though. It’s not a perfect show, rough around the edges as Simon mentioned, heck, it’s not even the best of the Sydney or Australian shows, but hey, live rock and roll isn’t supposed to be perfect, right? Rusty. Thanks for that Rusty, a good read. I do not yet have full details of the Japanese edition which was also issued as a monster box set. Interesting about the 5.1; it sounds like it was engineered for the DVD and then that version was just folded down for the stereo CD rather than tackled specially which it needed to be. All EU formats (CD, DVD and vinyl) available through the DTB Online Store. I think, this is a stunning concert from the re-united Deep Purple Mk2. Ritchie Blackmore was brilliant AND communicative (!). He interplayed with the other members and smiled a lot; it made me smile too while watching the DVD. Many people say that Jon Lord’s Hammond is low in the mix, but I could hear (and see) him, when it was necessary. The CD’s are also fine to me, sounds far better than the old (poorly recorded) Knebworth ’85 show. And one little comment for the ’87 era: HOTBL wasn’t so bad. It had some good “riffy” songs (Mad Dog, Bad Attitude, Dead or Alive etc.) and their live versions on Nobody’s Home live CD were also good. I hope it will get a decent remastering sometime in the future. After living with it for a week I’ve found myself gravitating to the DVD more than the audio side of things. I agree its a fascinating listen, as you can almost hear the guys working things on the fly as the gig goes on – seeing what works and what doesn’t, I recommend listening to the Knebworth set straight after Sydney and you get an idea how those nuances that been developed and progressed over six months of constant live performance – ‘Perfect Strangers’ being a case in point. Alas, I then compromised everything by blasting through Stuttgart from 1993, and the difference is startling- it could be a totally different band. Just Ritchie’s tone, improvisations and solos still makes Stuttgart the best official live Mk II reunion release by far. Tend to agree Roy, that last Mk 2 tour (and sadly we have to acknowledge now it was the end of Mk 2) produced some amazing performances, albeit not necessarily for the best reasons. Maybe I m wrong or it’s just a marketing strategy, but judging just by the official video samples online, the cd/dvd/vinyl are in incredible “amazing mono”?!? Personally I love on this format (we have two ears but just one brain and mono saves neural job to keep the focus. At least the company will not have complaints the Lord/Blackmore channels are reversed. They may have done samples in mono as it often works better on laptops and tablets. The CD is stereo, and the DVD in 5.1. Got to say this is far far better than I expected. Ritchie is Great and Gillan’s singing is near perfect. Watching all the smiles onstage I have to think how did it fall apart so fast. Maybe the band should have taken more time off after the tour so they cold work on their solo stuff. Issuing a live album in late 1986 instead of recording HOBL, then regrouping in late 1987 for an album. It’s fairly well documented that Ritchie wanted an album / tour routine then off. Doing that periodically might have indeed meant tensions didn’t build up, and also given the group a bigger profile. The statement that ‘sometime Ritchie’s guitar work worked and others it didn’t’ is an understatement. I enjoyed the DVD, perhaps my memories of this era of DP were a little rose-tinted, my favourite line up. They had better nights, Knebworth was indeed better, but the HOBL tour was superb – perhaps RB had worked out the “cutting edge” a little more. Wonder if the other Australian Concerts filmed in 1984 are complete? If so, will they ever get released? I had a very very good time watching this one. The energy is incredible! Although Rusty is right: Blackmore lets his showmanship get in the way quite often here. His playing is very fast, flashy and furious, the melodies we all know he can come up with during solos (the thing I always admired about him most) are sadly missing most of the time. But, oooh – the energy! And the memories. 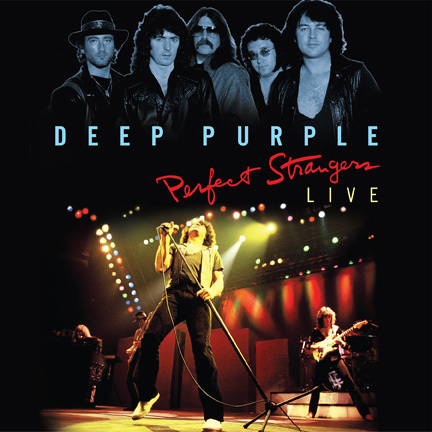 A great addition to my collection and for me one of the best DVDs of Purple ever – and the first time in a long time I could really enjoy all the old songs we get to hear on every new live release. PERFECT STRANGERS LIVE captures the power of the band very well I think. Let me tell you this. If you’re a fan of the Mark 9 or so with Steve Morse, you might be a little confused. No beautiful melodies, no good to follow guitar solo’s. But if you were fan of the ever so brilliant Mark 2 with Blackmore… buy it, steal it, get yourself a copy. It’s the Purple I like most. Raw, powerful. My God Blackers is so damned good. I was at all three Melbourne shows in that Dec 1984, so once I see the DVD I will know where it was taped. Ahhhh…hazy days of youth. The best gig I saw for organ sound was 1993 at Manchester Apollo – three days later at Birmingham Jon might as well not been there. You’d have thought after nearly 30 years they’d have come up with some wizardry to get the sound right! Me and three friends were at Knebworth, not the greatest sound ever – it can’t be worse than that! I look at the set list and its the same old same old – the old songs against new question for me and its still going on. 4 new songs maximum and at the expense of the last set of new songs or 29% of set – and only in the first half of the set. The 2013 set is 23% new – and this from what we could be saying in ten years time was their best album since 1996! Back in 1974 it was 71% new and 45% in 1976. What are the chances before they call it a day of them doing a tour for the fans – start with HS finish with Smoke – and everything in between from the Morse era only! Knebworth edges this on audio? Forget what I said. My old memory cells playing tricks! I had a quick compare over the weekend, and the limitations of Knebworth much more apparent than I remembered. And yep, Ritchie far more tip top in Sydney. While the Knebworth performance is really good the audio suffers from being an FM broadcast. Too bad. That would have been a good show to have filmed and recorded on multi-track. It was done on multi-track but sadly these were erased not long after the broadcasts, so were not available for the Connoisseur release. DP had the opportunity to own the tapes but didn’t take it… der. It was not filmed, except for a little bit by the local TV news.